Hello! We are very pleased that you are interested in our token as well as the platform. If you have any questions we can answer them! First - do not panic! The CRYPTO BROTHERS team is interested in the growth of a token, therefore DUMPS are completely excluded from our side. Secondly, in addition, with very high cyclicality (about once every 3-4 days) we get the means to maintain the liquidity of the token, with the profit from the trading operations of our trading systems. The third is a correction a matter of time, as you understood, the rate of our investment currency is always striving upwards. Fourth, you need to understand why the corrections occur, mostly it is the fixation of profits by some market participants, and it happens that a speculator enters the token and, without waiting for a result, leaves the market on current purchase requests at a loss (a very frequent occurrence on crypto-counter-trading). Fifth, we write trading recommendations on how best to enter the market to buy at the best prices. Sixth - we recommend to enter the token for a long period of time from six months and more, this will at least exclude speculative losses. In general, there are living examples of people who trusted our recommendations and multiplied their assets at times! And the seventh - our token has a very low rate today, investing now, you increase the chances of increasing your assets by increasing the demand for our digital asset. That’s all for now! We wish all holders of CRYPTO BROTHERS Growth Assets !! Next week, our roadmap (development plan) will be published, a forum at the Waves site on our token will be opened, as well as technical works and minor site updates for more complete information. Also, when the price reaches 0.00048, open an additional trading strategy to diversify the pool of assets. Dear investors, I appeal to you with a request! Count your money when working with volumes. In fact, they charge us for placing orders, -0.003 Waves when we want to buy, and -0.003 Waves when we want to sell. Therefore, I urge you not to operate with too small a volume … For example, purchases / sales of 10-20 Crypto Brothers! You will pay more commission, without having received useful value !! Now the token has an official logo! Wow, a great asset, I see! What do you think, guys, does it make sense to buy it right now, or should I wait for a bit more? I’m not a day-trader or something, just wanna buy for a few weeks or even months. Buy now. This price is very cheap. Even though, “the price is very cheap” as it was mentioned above, you have to remember that you and only you are responsible for your investment choices. The thing is, even SNP500 is pretty volatile now (not to mention bitcoin and other cryptos). So, if you’re a cryptoenthusiast and prefer to diversify your portfolio, crypto brothers might be a great opportunity NOW. Just a quick question. Where can I get more info about crypto brothers? Do you have a blog, a website? The friend of my referred me here and told that this is a great investment opportunity. 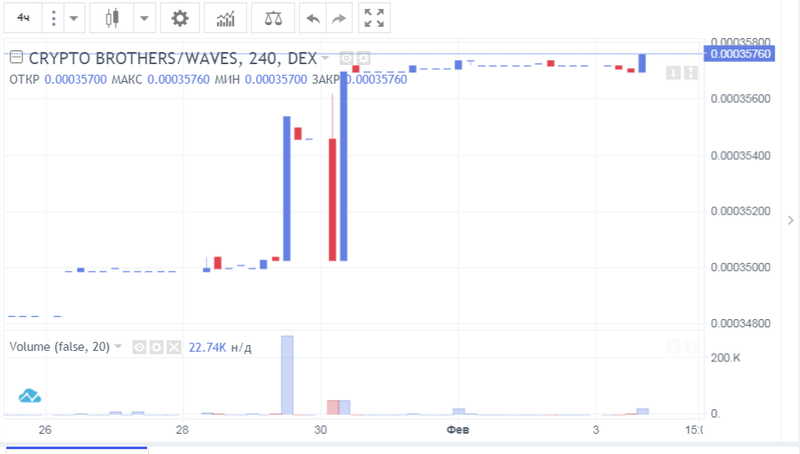 Could you share the link to your official page where I could find a live chart, trading volume and any other additional info that may be available for investors? Just go to https://cryptobrothers.online and you’ll find all the information you need. There is a FAQ section out there. Now the price is 0.0003572. Had you purchased it a month ago, today you would’ve already doubled your investment. Nobody can predict the future, though. So, be careful! Ok, I’ll give it a try and will let you know what I think in a week or so. Btc taught us a lot So, even if the price goes up tomorrow I won’t be that excited. The real excitement comes when you sell and take profit. 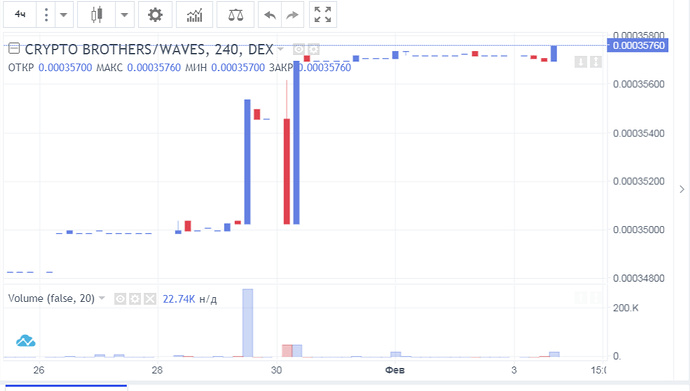 The trading volumes of our token range from 10 to 350 waves per day, we do not take any steps to increase the volume, our task is always to maintain liquidity at a high level. Over time, our trading volumes will increase naturally. This does not prevent our token from growing by hundreds of percent. Thanx, will be following you. The current price is 0.0003572 (as it was yesterday). Trading volume is so low… This is not the problem, though. I’m not expecting fast results. First, the higher you climb, the harder you fall. Second, look at the following chart. It’s a pretty volatile asset, isn’t it? but it’s not a get rich quick scheme! Making or losing 10-20% within a day is still possible, but we all expect to make more money in longer periods of time. I believe that this is the best way to increase the deposit. (HOLD) Because with our trading volumes, speculation is not appropriate. We go to meet the investors and publish the best entry points. The answer is simple: the bidder himself determines when and how much to invest and make profits. We only help to understand our asset. Just wanted to make sure that I fully understand the concept, because a buy-and-hold approach only works when you’re totally familiar with a particular asset. So, CB is just ordinary cryptocurrency which means it’s not like a stock, bond or something like that. In this case, which one is the most influential factor that determines the price? 2 factors, 3 factors?